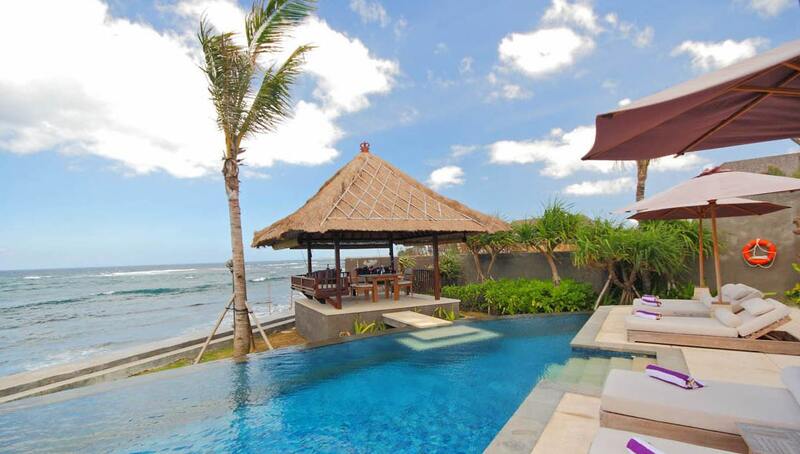 11 Luxe Villas in Bali - Perfect for Seniors! 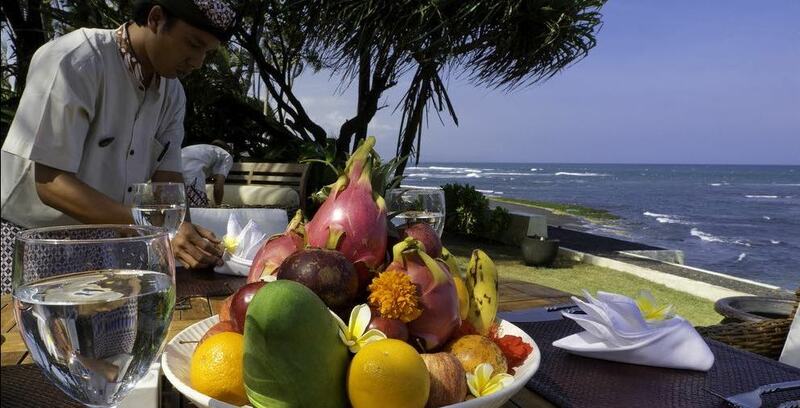 Nusa Dua, Sanur and Jimbaran are perfect Bali holiday destinations for seniors, retirees & pensioners; offering a relaxing and slightly more slow paced Bali holiday experience, perfect for those seeking a tranquil, restful & laid back holiday. All three locations provide easy access to white sandy beaches, supermarkets, pharmacies and a gamete of popular beachfront cafes and restaurants. Enjoy the calm clear waters, perfect for taking a refreshing dip in between sun baking by the pool or on the foreshore. 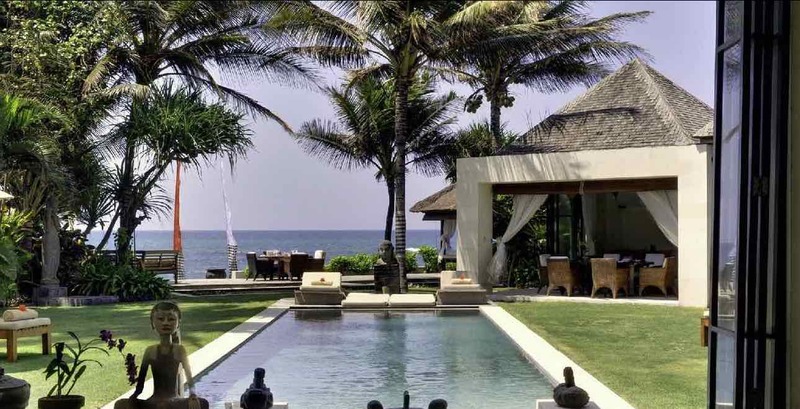 You might have previously staying in one of our Seminyak villas or other Bali villas around the island – perhaps you have already stayed in one of our Sanur Villas and you keen to come back. All three locations are quite strategic; located within 20mins of the International Airport, where our chauffeur will whisk you away to your family holiday villa. 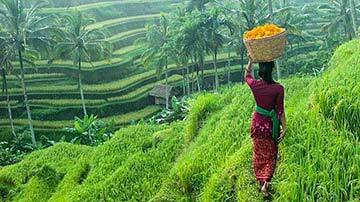 Best of all you can enjoy fabulous day trips to Bali’s cultural centre, Ubud as well as popular east coastal towns such as Amed and Candidasa. We recommend visiting in the dry and less humid season, from March to October. So here are a selection of fabulous, fully serviced senior holiday villas, in all three locations, of varying size and budget. 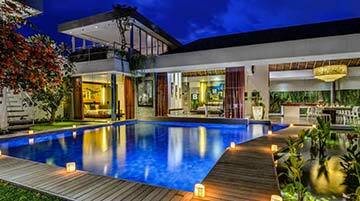 Bali Villa Escapes looks forward to taking care of you in Bali, for a relaxing and hassle free, Bali holiday! all our villas are fully staffed with: villa manager, housekeeping, security and in some cases butlers and a concierge. FREE airport pick up. You will be met at the airport and taken to your villa. most villas come with breakfast included to get you started for the day. There are also tea & coffee making facilities as well as fresh bottled water. some villas will have an in house chef to cook meals for you. They can cater for specific dietary requirements as well. Sleeping up to 6 guests, the villa is within the safe confines of a private villa complex, consisting of 3 private holiday villas. You can soak up the rays around your 12 meter pool, take a nap in a beachfront bale and enjoy meals prepared by your chef and butlers on the beachfront, or indoors for a formal meal, amid the comforts of air-conditioning. Enjoy the pleasures of Pabean Beach, or be chauffeur driven to central Sanur, just a quick 10 minute drive away with absolutely everything you will need, to compliment your getaway on the Island of the Gods. 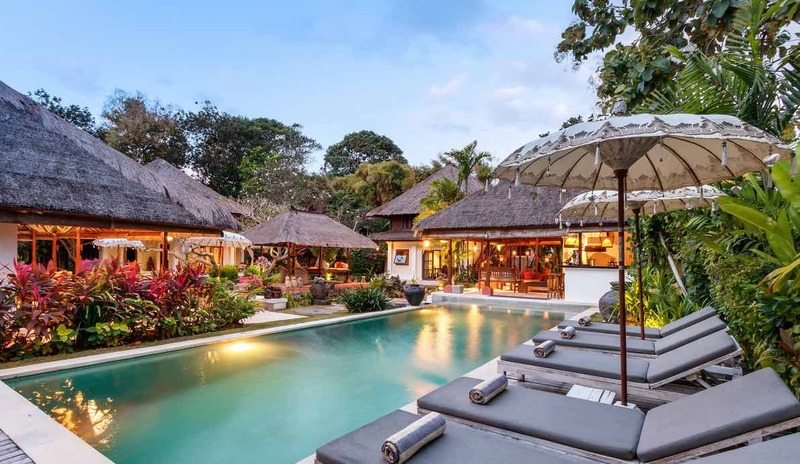 If you’re looking for something authentically Balinese, with a beautiful well established tropical garden and plenty of room for up to 10 guests, then Villa Arimbi is a seniors paradise! Charming, traditional Balinese parasols grace your private pool, while alang-alang thatched rooved pavilions add to the traditional charm of Villa Arimbi. Beautiful antique furnishings, complete modern amenities, calming koi fish ponds, comfortable sleeping quarters and our friendly staff, will guarantee a rejuvenating escape. 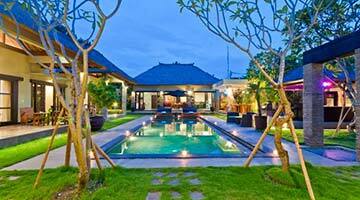 Villa Bayu Gita is located at Ketewel just a few minutes past central Sanur and part of a private 2 villa estate. Just in case you are travelling with extended family members, you can rent the adjoining sister villa, ideal for a family reunion with your in laws or parents, so you can all stay together in beachfront luxury. You may prefer to just relax in your own bedroom sanctuary, considering two of the master suites also boast relaxing, private plunge pools. Your private chef will add a tad, or maybe plenty of spice to your holiday diet, the choice is all yours! Offering an absolute beachfront location, Villa Majapahit Maya delivers exceptional holiday Seniors & retirees accommodation. An expansive manicured lawn sprawls around your private pool and leads down to the beachfront alfresco dining table, literally right on the water’s edge. The villa boasts two swimming pools with a great poolside Joglo, complete with a dining area and separate kitchenette. No doubt much time will be spent looking across the azure ocean, being pampered by the friendly staff, in between outings to nearby, central Sanur and the markets and galleries of Ubud. You will feel totally relaxed and comfortable in the wonderful villa right on the beach! Located in the safety of a private villa complex, Villa Puri Saanti will leave you spellbound. The villa is modern and contemporary, with an emphasis on modern luxury and the latest in comforting amenities. However, all of that is secondary to the time you will enjoy, around your absolute beachfront, private infinity swimming pool. 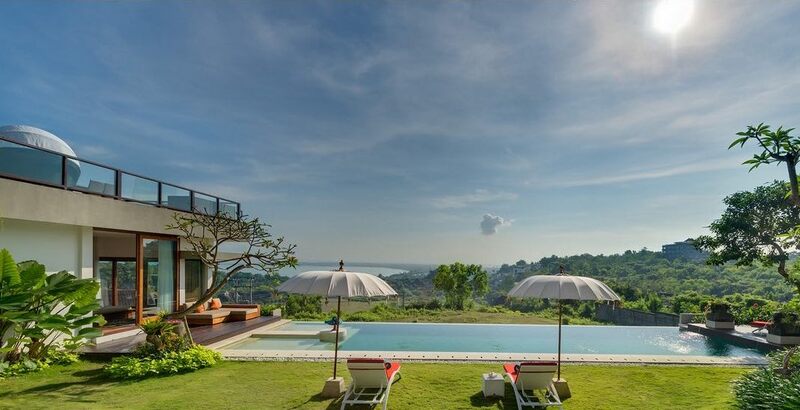 Offering breathtaking views across the Lombok Straits, to the majestic Mount Agung, Villa Puri Saanti will leave you in a relaxed and peaceful state and fully rejuvenated. 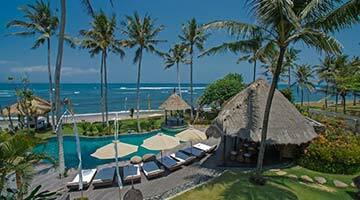 A mix of Balinese, come colonial charm will take you to another place, far, far away from the stresses of city life. This sprawling 6 bedroom estate offers beachfront living amid huge sprawling gardens over 4,500sq meters of tropical wonderland. 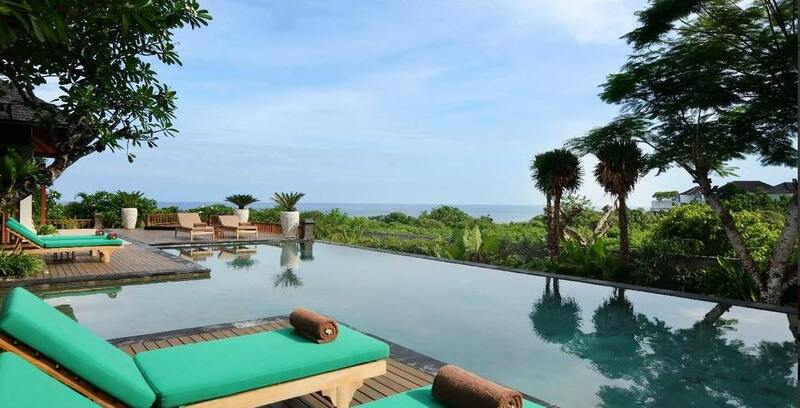 The villa has just about everything from a 16 metre infinity pool to an air-conditioned cinema room, state-of-the-art kitchen, dining and lounge areas that are totally luxurious. If you were looking for a special Seniors holiday villa, or villa where the whole family can get away from it all, this would be perfect! As you lay under the warm Bali sun in the comfort of a poolside recliner, a panoramic view of the Nusa Dua hills and Indian Ocean present. While the fragrant scent of frangipani will whisk you away to a place of peace and relaxation. The formal dining table for 10, with its high backed chairs, is set for glamorous dining experiences and the private lounge area, equally stunning, will leave you feeling like a king on your Bali escape. Enjoy complimentary daily breakfasts of your preferred liking, as well as in-house massages and spa services. The grand children will be busy at play with both indoor and outdoor playgrounds when not enjoying family fun at the nearby Geger Beach. Complete holiday privacy, modern Interiors and just 15mins from the International Airport, Villa Amelie has all the ingredients for 6 lucky senior guests to spend quality holiday time together. The villa offers full time security and staff to take care of all your holiday needs. The Nusa Dua Peninsula has beautiful white sand beaches for leisurely strolls, an array of water sport activities and a fabulous championship, 18-hole golf course; Bali National. Expect nothing less than 5-star services and amenities at Villa Amelie, leaving will be the hardest part of your holiday. If you are you looking for that perfect holiday villa to accommodate up to 4 guests, maybe with the grandchildren in mind, then Villa Reika is a fabulous, affordable option. While you can enjoy a pleasant night’s sleep in your King size bed with private en-suite, the children will have their own beds in a twin single room, both overlooking the private infinity pool. 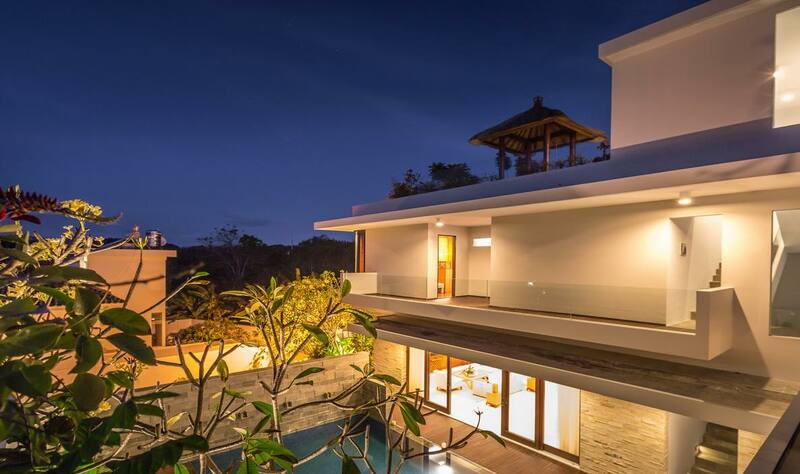 The villa is part of a private complex so you will be safe and sound and the wonderful Jimbaran Bay is nearby where both young and old alike can enjoy the calm waters and wonderful seafood dining options. njoy all the beautiful beaches of the Bukit Peninsula, have a round of golf or witness the magical fire dance at Uluwatu Temple. 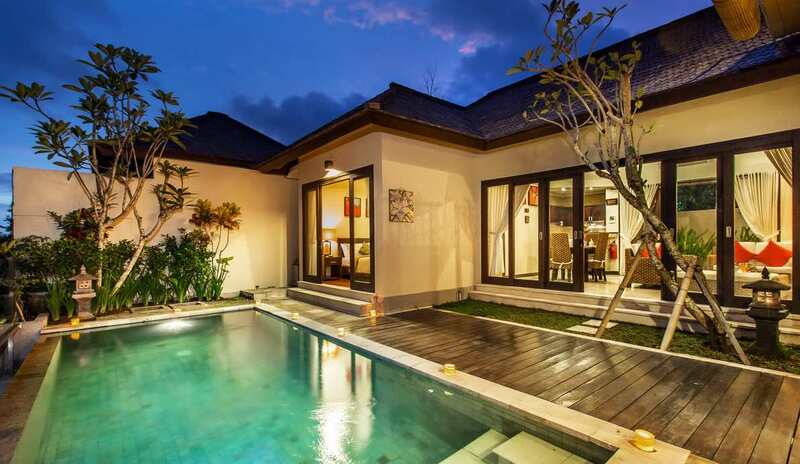 The villa comfortably sleeps 8 guests and is fully serviced throughout your stay. 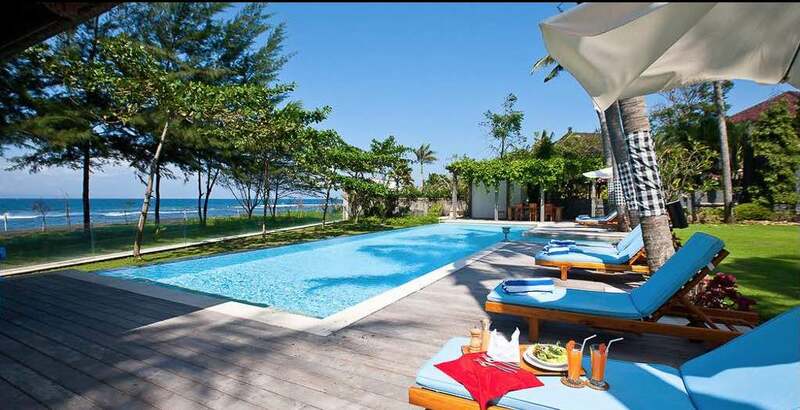 Holiday in the lap of luxury at Villa Teana! An ideal family & seniors oriented holiday villa, complete with stylish furnishings, fixtures and fittings and a generous private pool for you to relax and unwind in the tropics. The villa has bedrooms over split levels with plenty of accommodation for 4 guests on the ground floor. The Master suite even boasts a baby grand piano for the budding or experienced pianist and there is plenty to see and do close to the villa. Enjoy a sunset seafood dinner on the beach at Jimbaran Bay, explore the Bukit Peninsula’s beautiful beaches and visit the tallest structure on the Island of the Gods, at the Garuda Wisnu Kencana Cultural Park.